Audio tapes from Tucker Carlson’s past were discovered by Madeline Peltz, who has Jewish and Detroit roots. Madeline Peltz isn’t your average 24-year-old living in Washington D.C. The young Media Matters for America researcher made a name for herself this past week when she dug up shocking audio clips from Fox News host Tucker Carlson’s past. Peltz not only found the tapes, but outlined evidence over the past decade of Carlson’s insulting remarks in her Media Matters report, part of an ongoing investigation against Fox News. Peltz, who grew up in Chicago and went to Oberlin College, has both Jewish and Detroit roots. Her maternal grandfather, the late Bernard Goldman, grew up in Detroit and attended Central High School. Media Matters’ decision to release these audio clips caused a flurry of enraged comments from both Carlson and his fan base last week. 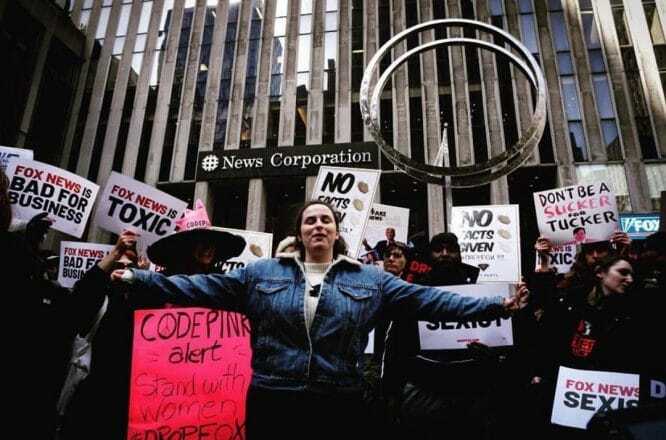 The discovery sparked a protest in front of Fox News headquarters in New York last week, where Peltz joined crowds in solidarity as they waved signs and chanted in opposition to Carlson’s toxic rhetoric. In an interview with the Detroit Jewish News, Peltz says she has received misogynistic, anti-Semitic messages from Carlson fans and right-wing spokespeople on social media. While she says this isn’t the first time she has received hateful comments, she’s determined to stand her ground. In the midst of an outcry from Carlson’s supporters, Peltz has quickly become an inspiration to people who stand with her against racism, sexism and homophobia. Carlson has complained that he’s a victim of bullying, but in this case, the “bully” is a 24 year-old who happens to be internet-savvy.